Since there's war in several countries all over the world, millions of refugees come to Europe every year – and much of them take the route over the Mediterranean Sea to the Greek islands. As a result there are a lot of traumatized young refugees in Greece. To help these kids Will Ascott, Ruby Mateja and Oisin Tammas started a skate charity called Free Movement Skateboarding about a year ago. We talked to Ruby about their project. What’s the concept of Free Movement Skateboarding? 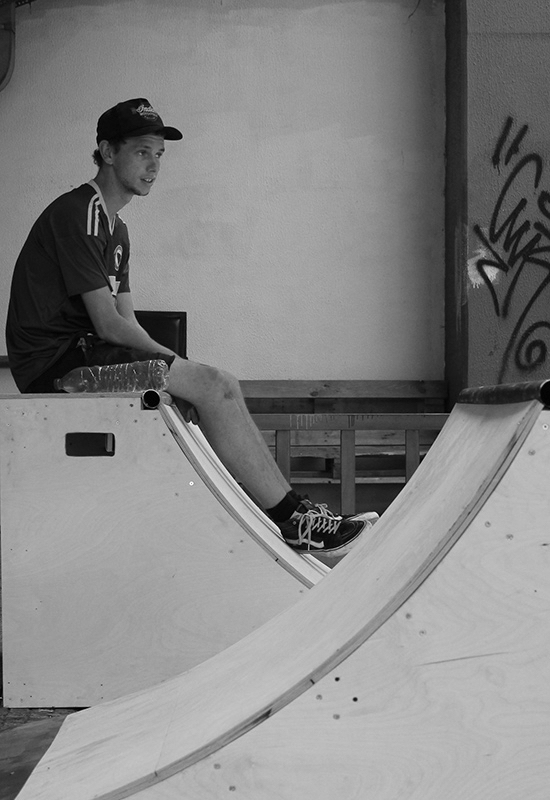 We want to introduce all the benefits of skateboarding to refugee communities. Having seen the wonderful effects of other skate charities such as Skateistan and SkatePAL for example, and how much such projects like these can benefit vulnerable communities, we were inspired to set up our own project specifically for refugee communities. 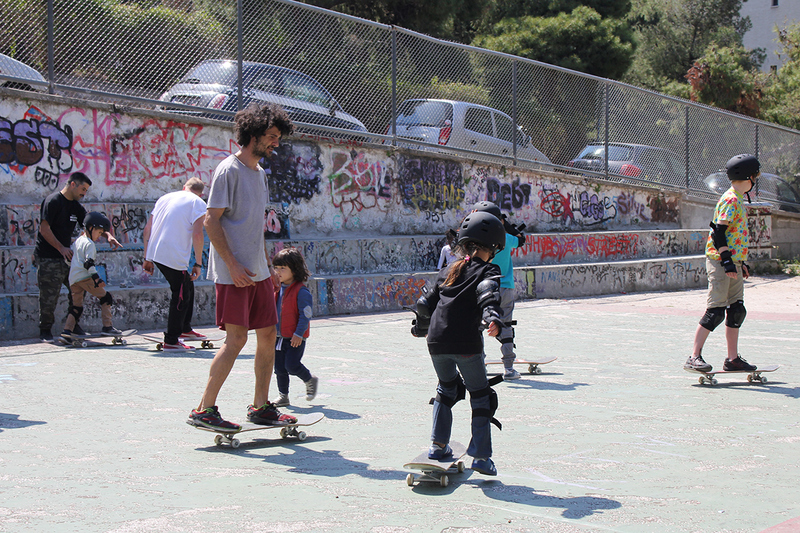 We have set up Free Movement Skateboarding in Athens. More specifically, by offering weekly sessions we are promoting: integration between Greek locals and the refugee population, gender equality, and physical and mental well-being. We teach in refugee camps and also hold open sessions in the city centre that are open to everyone – most sessions you will see boys and girls from all over the world skating together! "Girls and boys of all different nationalities and ages skate together in harmony." Girls and boys of all different nationalities and ages skate together in harmony. Anyone who skates will understand the feeling of inclusion that skateboarding can give you – you can go to any new place, and as long as you have your skateboard you will be sure to interact with the locals and make new friends. We hope that by giving the young individuals we teach this first step into the world of skateboarding, they will then become more confident and use their skateboard as a tool for interacting with other people and the cityscape in new and exciting ways. We all know that skateboarding is a challenging activity, one that requires focus and determination – in this way it is a great way to clear your head and forget, even if just momentarily, about the all the stuff they went through. In November 2016. Our founder Will Ascott was in Athens volunteering at a community centre when he casually brought up the idea with one of the founders of Help Refugees. They really took to the idea and told him to write up an extensive plan. This is when he contacted me and asked if I’d be up for getting involved. We had met in Palestine exactly a month before, and spent that month volunteering for SkatePAL teaching kids and teenagers how to skate. We had both felt inspired by the time we spent there, and spoke at the time of all the other places that would benefit from a similar project. We spent some time planning every little detail of the formation of our project, and were ecstatic when Help Refugees offered to fund us for our first year! We did some fundraising in the UK and managed to gather 50 second-hand boards and equal amounts of safety equipment. Myself, Will Ascott and Oisin Tammas currently work on the project full-time. We have a small crew of amazing volunteers and have now started to pay a couple of local instructors. A big part of our ethos is to create job opportunities for Greek locals and refugees, which we will continue to do as we expand. We try to keep our team as diverse as possible, employing Greeks, refugees, males, females, different ages. "The more time we have to put into the project means more people can benefit from the sessions." Our personal motivation comes from very similar places; being angry and disillusioned with the state of the world and trying to find a way to use our personal skills and motivation to provide something that can benefit vulnerable people, even if it is on such a small scale. A mutual love of skateboarding, and witnessing first-hand the incredible impacts that it can have on whole communities at large. Personally, I see the project as an opportunity to help empower girls and women through skateboarding – many of the girls we teach come from very tradition cultures, and as they progress into their teens they are often discouraged from taking part in any physical activities. Skateboarding can counter this because it is quite often unknown to these cultures, so by introducing it as an activity that anyone can do (no matter their age or gender) we can create real gender parity from the offset. Watching these girls become more and more confident and daring on and off the board is truly incredible. Myself and Will both have backgrounds working with vulnerable people, so we felt reasonably well equipped to enter into this situation, and since arriving we have done more training which specifically teaches about people who have been through prolonged stress and trauma. Will also set up and ran a skate school in the UK so he had a good understanding of the operations side of things prior. At the moment we are fully supported by Help Refugees and our own crowdfunding. We have just launched a campaign to try and raise funds for our proposed indoor skatepark. How many kids take part in your project? We currently teach up to 150 kids a week, with around 300 signed up to our sessions. This number will continue to grow as we expand and can reach out to more camps and squats. And if we manage to open a permanent indoor facility this will offer a space for people to come and skate every day of the week! The numbers will be huge! The kids that we teach are predominantly between 6 and 14 – but we also teach older teens and people in their 20’s! "For most of the kids it’s just pure enjoyment of taking part in an exhilarating activity." What do the kids take from the project? For most of the kids it’s just pure enjoyment of taking part in an exhilarating activity! Something to stimulate them and possibly relieve built-up anger and frustration from their current situation. This is especially important for the kids who live in camps. They live in close quarters with many other people, and tensions can easily arise. Many of the kids have gone through a lot of trauma in their home countries and during the journey out here; they are quite often quick to become aggressive. Skateboarding is a really great way to channel this pent-up aggression. We really encourage the kids to see each other as peers rather than competitors or enemies, and to support each other whilst learning this new skill. What do you guys take from the project? Being able to introduce so many young people to skateboarding, those who really need it the most, is truly amazing for us. We get so much satisfaction from seeing the kids learn and progress – but more than that, just seeing the kids enjoy themselves and lose themselves in skateboarding. Some of the greatest experiences have been seeing the transition of the kids when they started to stop treating each other as competitors, but rather supporting and encouraging each other along the way. Seeing them help each other up when they fall, teaching each other, and cheering each other on when they learn something new. What about the skatepark you are planning? We have just launched a campaign to try and raise the funds for our planned indoor skatepark. This space would transform our project – it would offer a safe place for people to skate all-year round, a place to socialise and meet new people, and create job opportunities for Greek locals and refugees. In association with Refugee Youth Service, we will offer support for the people that use our centre and collaborate with other organisations to promote dignity and well being for all. Alongside the skatepark, our studio space will offer yoga, art therapy, music and other cultural sessions, encouraging a diverse user group. Whether for private tuition, skate demos, competitions or cultural events, the skate park will cater to the needs and passions of our skate community. In the future we hope to have a sufficient team to be able to expand to other places. In the short-term, we have already started to make arrangements to set up the project on a couple of islands by collaborating with existing organisations there. In the long-term we hope to reach out to other parts of Greece and different countries too! We have our sights held high!